Alexander Hamilton (January 11, 1755 or 1757 – July 12, 1804) was a U.S. Constitution, the founder of the nation's financial system, and the founder of the first political party. As establishment of a national bank, a system of tariffs, and friendly trade relations with Britain. He became the leader of the Federalist Party, created largely in support of his views; he was opposed by the Democratic-Republican Party, led by Thomas Jefferson and James Madison. Hamilton played a major role in the France after the XYZ Affair and secured an appointment from President John Adams as commander of a new army, which he readied for war. However, the Quasi-War, while hard-fought at sea, was never officially declared and did not involve army action. In the end, Adams found a diplomatic solution which avoided a land war. Born out of wedlock to a Scottish-French mother and raised in the West Indies, Hamilton was orphaned at about age 11. Recognized for his abilities and talent, he was sponsored by people from his community to go to North America for his education. He attended King's College (now Columbia University), in colonial New York. After the war, Hamilton was elected to the Congress of the Confederation from New York. He resigned, to practice law, and founded the Bank of New York. In the new government under President Secretary of the Treasury. An admirer of British political systems, Hamilton was a nationalist, who emphasized strong central government and successfully argued that the implied powers of the Constitution provided the legal authority to fund the national debt, assume states' debts, and create the government-owned Bank of the United States. These programs were funded primarily by a tariff on imports, and later also by a highly controversial excise tax on whiskey. Embarrassed when an extra-marital affair became public, Hamilton resigned his Cabinet position in 1795 and returned to the practice of law in New York. He kept his hand in politics and was a powerful influence on the Cabinet of President Adams (1797–1801). Hamilton's opposition to Adams' re-election helped cause his defeat in the 1800 election. When in the same contest, Thomas Jefferson and Aaron Burr tied for the presidency in the electoral college, Hamilton helped defeat Burr, whom he found unprincipled, and to elect Jefferson despite philosophical differences. After failing to support Adams, the Federalist Party candidate, Hamilton lost some of his national prominence within the party. Vice President Burr later ran for governor in New York state, but Hamilton's influence in his home state was strong enough to again prevent a Burr victory. 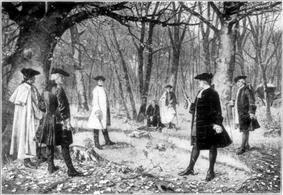 Taking offense at some of Hamilton's comments, Burr challenged him to a duel and mortally wounded Hamilton, who died the next day. 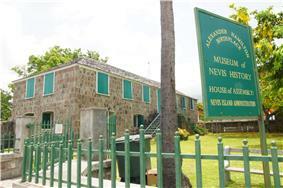 Alexander Hamilton was born in Charlestown, the capital of the island of Nevis, in the Leeward Islands; Nevis was one of the British West Indies. Hamilton was born out of wedlock to Rachel Faucette, a married woman of partial French Huguenot descent, and James A. Hamilton, the fourth son of the Scottish laird Alexander Hamilton of Grange, Ayrshire. His mother moved with the young Hamilton to St. Croix in the Virgin Islands, then ruled by Denmark. It is not certain whether the year of Hamilton's birth was 1757 or 1755; most historical evidence after Hamilton's arrival in North America supports the idea that he was born in 1757, and many historians had accepted this birth date. But, Hamilton's early life in the Caribbean was recorded in documents which were first published in Danish in 1930; this evidence has caused historians since then to favor a birth year of 1755. Hamilton listed his birth year as 1757 when he first arrived in the Thirteen Colonies. He celebrated his birthday on January 11. In later life, he tended to give his age only in round figures. Probate papers from St. Croix in 1768, after the death of Hamilton's mother, list him as then 13 years old, a date that would support a birth year of 1755. Historians have explained the different birth years by the following: If 1755 is correct, Hamilton may have been trying to appear younger than his college classmates or perhaps wished to avoid standing out as older; on the other hand, if 1757 is correct, the probate document indicating a birth year of 1755 may have been in error, or Hamilton may have been attempting to pass as 13, in order to be more employable after his mother's death. James Hamilton abandoned Rachel and their sons, allegedly to "spar[e] [Rachel] a charge of bigamy . . . after finding out that her first husband intend[ed] to divorce her under Danish law on grounds of adultery and desertion." Thereafter, Rachel supported her children in St. Croix, keeping a small store in Christiansted. She contracted a severe fever and died on February 19, 1768, 1:02 am, leaving Hamilton effectively orphaned. This may have had severe emotional consequences for him, even by the standards of an 18th-century childhood. In probate court, Rachel's "first husband seized her estate" and obtained the few valuables Rachel had owned, including some household silver. Many items were auctioned off, but a friend purchased the family's books and returned them to the young Hamilton. Hamilton became a clerk at a local import-export firm, Beekman and Cruger, which traded with New England; he was left in charge of the firm for five months in 1771, while the owner was at sea. He and his older brother James were adopted briefly by a cousin, Peter Lytton; but when Lytton committed suicide, the brothers were separated. James apprenticed with a local carpenter, while Alexander was adopted by a Nevis merchant, Thomas Stevens. According to the writer Ron Chernow, some evidence suggests that Stevens may have been Alexander Hamilton's biological father; his son, Edward Stevens, became a close friend of Hamilton. The two boys were described as looking much alike, were both fluent in French, and shared similar interests. Hamilton continued clerking, but he remained an avid reader, later developing an interest in writing, and began to desire a life outside the small island where he lived. He wrote an essay published in the Royal Danish-American Gazette, a detailed account of a hurricane which had devastated Christiansted on August 30, 1772. The essay impressed community leaders, who collected a fund to send the young Hamilton to the North American colonies for his education. In the autumn of 1772 Hamilton arrived at Elizabethtown Academy, a grammar school in Elizabethtown, New Jersey, by way of Boston, Massachusetts. In 1773 he studied with Francis Barber at Elizabethtown in preparation for college work. He came under the influence of William Livingston, a leading intellectual and revolutionary, with whom he lived for a time at his Liberty Hall. Hamilton matriculated at King's College in New York City (now Columbia University) in late 1773 or early 1774. In what is credited as his first public appearance, on July 7, 1774 at the liberty pole at King's College, Hamilton's friend Robert Troup spoke glowingly of Hamilton's ability to clearly and concisely explain the rights and reasons the patriots have in their case against the British. When the Church of England clergyman Samuel Seabury published a series of pamphlets promoting the Loyalist cause in 1774, Hamilton responded anonymously with his first political writings, "A Full Vindication of the Measures of Congress" and "The Farmer Refuted". Seabury essentially tried to provoke fear into the colonies and his main objective was to stopgap the potential of a union among the colonies. Hamilton published two additional pieces attacking the Quebec Act as well as fourteen anonymous installments of "The Monitor" for Holt's New York Journal. Although Hamilton was a supporter of the Revolutionary cause at this prewar stage, he did not approve of mob reprisals against Loyalists. On May 10, 1775, Hamilton supposedly saved his college president Myles Cooper, a Loyalist, from an angry mob by speaking to the crowd long enough for Cooper to escape. In 1775, after the first engagement of American troops with the British in Boston, Hamilton joined a New York volunteer militia company called the Hearts of Oak, which included other King's College students. He drilled with the company, before classes, in the graveyard of nearby St. Paul's Chapel. Hamilton studied military history and tactics on his own and achieved the rank of lieutenant. Under fire from HMS Asia, he led a successful raid for British cannon in the Battery, the capture of which resulted in the Hearts of Oak becoming an artillery company thereafter. Through his connections with influential New York patriots such as Alexander McDougall and John Jay, he raised the New York Provincial Company of Artillery of sixty men in 1776, and was elected captain. It took part in the campaign of 1776 around New York City, particularly at the Battle of White Plains; at the Battle of Trenton, it was stationed at the high point of town, the meeting of the present Warren and Broad Streets, to keep the Hessians pinned in the Trenton Barracks. Hamilton was invited to become an aide to Nathanael Greene and to Henry Knox; however, he declined these invitations, believing his best chance for improving his station in life was glory on the battlefield. Hamilton eventually received an invitation he felt he could not refuse: to serve as Washington's aide, with the rank of Lieutenant Colonel. Washington felt, "Aides de camp are persons in whom entire confidence must be placed and it requires men of abilities to execute the duties with propriety and dispatch." Hamilton served for four years as Washington's chief staff aide. He handled letters to Congress, state governors, and the most powerful generals in the Continental Army; he drafted many of Washington's orders and letters at the latter's direction; he eventually issued orders from Washington over Hamilton's own signature. Hamilton was involved in a wide variety of high-level duties, including intelligence, diplomacy, and negotiation with senior army officers as Washington's emissary. The important duties with which he was entrusted attest to Washington's deep confidence in his abilities and character, then and later. At the points in their relationship when there was little personal attachment, there was yet always a reciprocal confidence and respect. During the war, Hamilton became close friends with several fellow officers. His letters to the Marquis de Lafayette and to John Laurens, employing the sentimental literary conventions of the late eighteenth century and alluding to Greek history and mythology, have been read by Jonathan Katz as revealing a homosocial or perhaps homosexual relationship, but few historians agree. Hamilton married Elizabeth Schuyler on December 14, 1780. She was the daughter of Philip Schuyler, a general and wealthy landowner from one of the most prominent families in the state of New York. The marriage took place at Schuyler Mansion in Albany, New York. 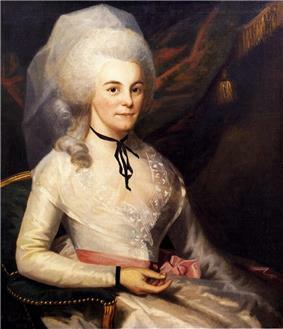 Hamilton was also close to Eliza's older sister, Angelica, who eloped with John Barker Church, an Englishman who made a fortune in North America during the Revolution. She returned with Church to London after the war, where she later became a joint friend of Maria Cosway and Thomas Jefferson. While on Washington's staff, Hamilton long sought command and a return to active combat. As the war drew nearer to an end, he knew that opportunities for military glory were diminishing. In February 1781, Hamilton was mildly reprimanded by Washington and used this as an excuse to resign his staff position. He asked Washington and others for a field command. This continued until early July 1781, when Hamilton submitted a letter to Washington with his commission enclosed, "thus tacitly threatening to resign if he didn't get his desired command." On July 31, 1781, Washington relented and assigned Hamilton as commander of a New York light infantry battalion. 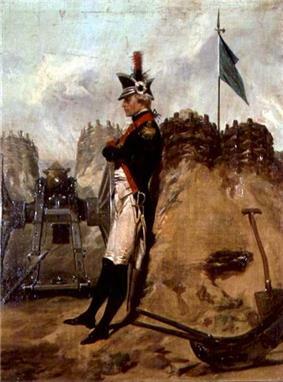 In the planning for the assault on Yorktown, Hamilton was given command of three battalions, which were to fight in conjunction with the allied French troops in taking Redoubts No. 9 and No. 10 of the British fortifications at Yorktown. Hamilton and his battalions fought bravely and took Redoubt No. 10 with bayonets in a nighttime action, as planned. The French also fought bravely, suffered heavy casualties, and took Redoubt No. 9. These actions forced the British surrender of an entire army at Yorktown, Virginia, effectively ending their major British military operations in North America. 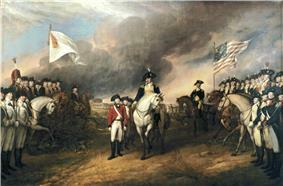 After the Battle of Yorktown, Hamilton resigned his commission. He was appointed in July 1782 to the Congress of the Confederation as a New York representative for the term beginning in November 1782. Hamilton supported congressmen such as Superintendent of Finance Robert Morris, his assistant Gouverneur Morris (no relation), along with James Wilson and James Madison, to provide the Congress with the independent source of revenue it lacked under the Articles of Confederation. 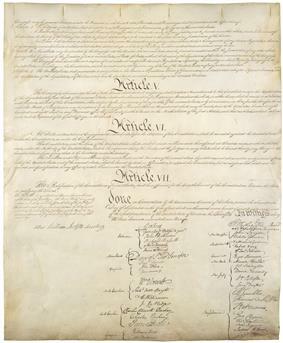 An amendment to the Articles had been proposed by Thomas Burke, in February 1781, to give Congress the power to collect a 5% impost, or duty on all imports, but this required ratification by all states; securing its passage as law proved impossible after it was rejected by Rhode Island in November 1782. Madison joined Hamilton in persuading Congress to send a delegation to persuade Rhode Island to change its mind. Their report recommending the delegation argued the federal government needed not just some level of financial autonomy, but also the ability to make laws that superseded those of the individual states. Hamilton transmitted a letter arguing that Congress already had the power to tax, since it had the power to fix the sums due from the several states; but Virginia's rescission of its own ratification ended the Rhode Island negotiations. While Hamilton was in Congress, discontented soldiers began to pose a danger to the young United States. Most of the army was then posted at Henry Knox sent a delegation to lobby Congress, led by Capt. Alexander MacDougall (see above). The officers had three demands: the Army's pay, their own pensions, and commutation of those pensions into a lump-sum payment. Several Congressmen, including Hamilton and the Morrris', attempted to use this Newburgh Conspiracy as leverage to secure support from the states and in Congress for funding of the national government. They encouraged MacDougall to continue his aggressive approach, threatening unknown consequences if their demands were not met, and defeated proposals that would have resolved the crisis without establishing general federal taxation: that the states assume the debt to the army, or that an impost be established dedicated to the sole purpose of paying that debt. Hamilton suggested using the Army's claims to prevail upon the states for the proposed national funding system. The Morrises and Hamilton contacted Knox to suggest he and the officers defy civil authority, at least by not disbanding if the army were not satisfied; Hamilton wrote Washington to suggest that Hamilton covertly "take direction" of the officers' efforts to secure redress, to secure continental funding but keep the army within the limits of moderation. Washington wrote Hamilton back, declining to introduce the army; after the crisis had ended, he warned of the dangers of using the army as leverage to gain support for the national funding plan. On March 15, Washington defused the Newburgh situation by giving a speech to the officers. 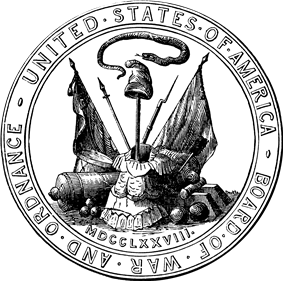 Congress ordered the Army officially disbanded in April 1783. In the same month, Congress passed a new measure for a twenty-five-year impost—which Hamilton voted against—that again required the consent of all the states; it also approved a commutation of the officers' pensions to five years of full pay. Rhode Island again opposed these provisions, and Hamilton's robust assertions of national prerogatives in his previous letter were widely held to be excessive. The Continental Congress was never able to secure full ratification for back pay, pensions, or its own independent sources of funding. In June 1783, a different group of disgruntled soldiers from Lancaster, Pennsylvania, sent Congress a petition demanding their back pay. When they began to march toward Philadelphia, Congress charged Hamilton and two others with intercepting the mob. Hamilton requested militia from Pennsylvania's Supreme Executive Council, but was turned down. Hamilton instructed Assistant Secretary of War William Jackson to intercept the men. Jackson was unsuccessful. The mob arrived in Philadelphia, and the soldiers proceeded to harangue Congress for their pay. The President of Congress, John Dickinson, feared that the Pennsylvania state militia was unreliable, and refused its help. Hamilton argued that Congress ought to adjourn to Princeton, New Jersey. Congress agreed, and relocated there. Frustrated with the weakness of the central government, Hamilton while in Princeton drafted a call to revise the Articles of Confederation. This resolution contained many features of the future US Constitution, including a strong federal government with the ability to collect taxes and raise an army. It also included the separation of powers into the Executive, Legislative, and Judicial branches. Hamilton resigned from Congress, and in July 1783 was authorized to practice law in New York after several months of self-directed education. He practiced law in New York City in partnership with Richard Harison. He specialized in defending Tories and British subjects, as in Rutgers v. Waddington, in which he defeated a claim for damages done to a brewery by the Englishmen who held it during the military occupation of New York. He pleaded for the Mayor's Court to interpret state law consistent with the 1783 Treaty of Paris which had ended the Revolutionary War. In 1784, he founded the Bank of New York, now the oldest ongoing bank in the United States. Hamilton was one of the men who restored King's College, which had been suspended since 1776 and severely damaged during the War, as Columbia College. Long dissatisfied with the weak Articles of Confederation, he played a major leadership role at the Annapolis Convention in 1786. He drafted its resolution for a constitutional convention, and in doing so brought his longtime desire to have a more powerful, more financially independent federal government one step closer to reality. In 1787, Hamilton served as assemblyman from John Lansing and Robert Yates, and both of them opposed Hamilton's goal of a strong national government. Thus, whenever the other two members of the New York delegation were present, they decided New York's vote; and when they left the convention in protest, Hamilton remained but with no vote, since two representatives were required for any state to cast a vote. Early in the Convention he made a speech proposing a President-for-Life; it had no effect upon the deliberations of the convention. He proposed to have an elected President and elected Senators who would serve for life, contingent upon "good behavior" and subject to removal for corruption or abuse; this idea contributed later to the hostile view of Hamilton as a monarchist sympathizer, held by James Madison. During the convention, Hamilton constructed a draft for the Constitution based on the convention debates, but he never presented it. This draft had most of the features of the actual Constitution, including such details as the three-fifths clause. In this draft, the Senate was to be elected in proportion to the population, being two-fifths the size of the House, and the President and Senators were to be elected through complex multistage elections, in which chosen electors would elect smaller bodies of electors; they would hold office for life, but were removable for misconduct. The President would have an absolute veto. The Supreme Court was to have immediate jurisdiction over all law suits involving the United States, and state governors were to be appointed by the federal government. 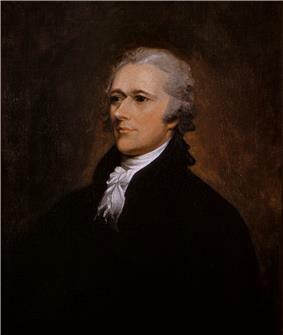 At the end of the Convention, Hamilton was still not content with the final form of the Constitution, but signed it anyway as a vast improvement over the Articles of Confederation, and urged his fellow delegates to do so also. Since the other two members of the New York delegation, Lansing and Yates, had already withdrawn, Hamilton was the only New York signer to the United States Constitution. He then took a highly active part in the successful campaign for the document's ratification in New York in 1788, which was a crucial step in its national ratification. "Let the thirteen States, bound together in a strict and indisoluble Union, concur in erecting one great American system, superior to the control of all trans-Atlantic force or influence and able to dictate the terms of the connection between the old and the new world!" In 1788, Hamilton served yet another term in what proved to be the last session of the Continental Congress under the Articles of Confederation. When the term of Hamilton's father-in-law Phillip Schuyler was up in 1791, elected in his place was the attorney general of New York, one Aaron Burr. Hamilton blamed Burr for this result, and ill characterizations of Burr appear in his correspondence thereafter. The two men did work together from time to time thereafter on various projects, including Hamilton's army of 1798 and the Manhattan Water Company. Bureau of Engraving and Printing portrait of Hamilton as Secretary of the Treasury. President George Washington appointed Hamilton as the first Treasury Department. In 1791 while Secretary, Hamilton was elected a Fellow of the American Academy of Arts and Sciences in 1791. In the Report on Public Credit, the Secretary made a controversial proposal that would have the federal government assume state debts incurred during the Revolution. This would give the federal government much more power by placing the country's most serious financial obligation in the hands of the federal government rather than the state governments. The primary criticism of the plan was from Secretary of State Thomas Jefferson and Representative James Madison. Some states, such as Jefferson's Virginia, had paid almost half of their debts, and felt that their taxpayers should not be assessed again to bail out the less provident. They further argued that the plan passed beyond the scope of the new Constitutional government. "I deserted Colonel Hamilton, or rather Colonel H. deserted me; in a word, the divergence between us took place from his wishing to administration, or rather to administer the Government into what he thought it ought to be..."
Hamilton eventually secured passage of his assumption plan by striking a deal with Jefferson and Madison. Hamilton would use his influence to place the permanent national capital on the Potomac River, and Jefferson and Madison would encourage their friends to back Hamilton's assumption plan. In the end, Hamilton's assumption, together with his proposals for funding the debt, overcame legislative opposition and narrowly passed the House on July 26, 1790. Hamilton's Report on a National Bank was a projection from the first Report on the Public Credit. Although Hamilton had been forming ideas of a national bank as early as 1779, he gathered ideas in various ways over the past eleven years. These included theories from Adam Smith, extensive studies on the Bank of England, the blunders of the Bank of North America and his experience in establishing the Bank of New York. His also used American records from James Wilson, Pelatiah Webster, Gouverneur Morris, and from his assistant Treasury secretary Tench Coxe. Hamilton suggested that Congress should charter the National Bank with a capitalization of $10 million, one-fifth of which would be handled by the Government. Since the Government did not have the money, it would borrow the money from the bank itself, and repay the loan in ten even annual installments. The rest was to be available to individual investors. The bank was to be governed by a twenty-five member board of directors that was to represent a large majority of the private shareholders, which Hamilton considered essential for his being under a private direction. Hamilton's bank model had many similarities to that of the Bank of England, except Hamilton wanted to exclude the Government from being involved in public debt, but provide a large, firm, and elastic money supply for the functioning of normal businesses and usual economic development, among other differences. For tax revenue to ignite the bank, it was the same as he had previously proposed; increases on imported spirits: rum, liquor, and whiskey. Adair, Douglas & Harvey, Marvin (1955). "Was Alexander Hamilton a Christian Statesman?". William and Mary Quarterly 12 (2): 308–329. Austin, Ian Patrick (2009). Common Foundations of American and East Asian Modernisation: From Alexander Hamilton to Junichero Koizumi. Singapore: Select Books. Bailey, Jeremy D. (2008). "The New Unitary Executive and Democratic Theory: The Problem of Alexander Hamilton". Burns, Eric (2007). Infamous Scribblers: The Founding Fathers and the Rowdy Beginnings of American Journalism. New York: PublicAffairs. Chan, Michael D. (2004). "Alexander Hamilton on Slavery". Review of Politics 66 (2): 207–231. Engerman, Stanley L.; Gallman, Robert E. (2000). The Cambridge Economic History of the United States. Cambridge University Books. Fatovic, Clement (2004). "Constitutionalism and Presidential Prerogative: Jeffersonian and Hamiltonian Perspectives". Federici, Michael P. (2012). Alexander Hamilton: America's Forgotten Founder. Johns Hopkins University Press. Flaumenhaft, Harvey (1992). The Effective Republic: Administration and Constitution in the Thought of Alexander Hamilton. Durham, NC: Duke University Press. Harper, John Lamberton (2004). American Machiavelli: Alexander Hamilton and the Origins of US Foreign Policy. New York: Cambridge University Press. Horton, James Oliver (2004). "Alexander Hamilton: Slavery and Race in a Revolutionary Generation". New York Journal of American History 65 (3): 16–24. Gibowicz, Charles J. (2007). Mess Night Traditions. Author House. Kennedy, Roger G. (2000). Burr, Hamilton, and Jefferson: A Study in Character. New York: Oxford University Press. Kaplan, Edward (1999). The Bank of the United States and the American Economy. Westport, CT: Praeger. Kaplan, Lawrence S. (2001). Alexander Hamilton: Ambivalent Anglophile. Rowman and Littlefield. Knott, Stephen F. (2002). Alexander Hamilton and the Persistence of Myth. Lawrence: University Press of Kansas. Kohn, Richard H. (1970). "The Inside History of the Newburgh Conspiracy: America and the Coup d'Etat". The William and Mary Quarterly 27 (2): 188–220. A review of the evidence on Newburgh; despite the title, Kohn is doubtful that a coup d'état was ever seriously attempted. Larsen, Harold (1952). "Alexander Hamilton: The Fact and Fiction of His Early Years". William and Mary Quarterly 9 (2): 139–151. Littlefield, Daniel C. (2000). "John Jay, the Revolutionary Generation, and Slavery". New York History 81 (1): 91–132. Lomask, Milton (1979). Aaron Burr, the Years from Princeton to Vice President, 1756–1805. New York: Farrar, Straus & Giroux. First volume of two, but this contains Hamilton's lifetime. Martin, Robert W. T. (2005). "Reforming Republicanism: Alexander Hamilton's Theory of Republican Citizenship and Press Liberty". Journal of the Early Republic 25 (1): 21–46. Mitchell, Broadus (1951). "The man who 'discovered' Alexander Hamilton". Proceedings of the New Jersey Historical Society 69: 88–115. Morgan, Philip D. & O'Shaubhnessy, A. J. (2006). "Arming slaves in the American revolution". In Brown, Christopher Leslie & Morgan, Philip D. Arming slaves: from classical times to the modern age. New York: Yale University Press. pp. 180–208. Newman, Paul Douglas (2004). Fries's Rebellion: The Enduring Struggle for the American Revolution. Philadelphia: University of Pennsylvania Press. Sharp, James (1995). American Politics in the Early Republic: The New Nation in Crisis. New Haven: Yale University Press. Survey of politics in 1790s. Sheehan, Colleen (2004). "Madison v. Hamilton: The Battle Over Republicanism and the Role of Public Opinion". American Political Science Review 98 (3): 405–424. Smith, Robert W. (2004). Keeping the Republic: Ideology and Early American Diplomacy. DeKalb: Northern Illinois University Press. Staloff, Darren (2005). Hamilton, Adams, Jefferson: The Politics of Enlightenment and the American Founding. New York: Hill and Wang. Storbridge, Truman R.; Noble, Dennis l. (1999). Alaska and the U. S. Revenue Cutter Service: 1867-1915. Naval Institute Press. Stourzh, Gerald (1970). Alexander Hamilton and the Idea of Republican Government. Stanford: Stanford University Press. Studenski, Paul; Krooss, Herman Edward (2003). Financial History of the United States. Beard Books. Sylla, Richard; Wright, Robert E. & Cowen, David J. (2009). "Alexander Hamilton, Central Banker: Crisis Management during the US Financial Panic of 1792". Trees, Andrew S. (2005). "The Importance of Being Alexander Hamilton". Reviews in American History 33 (1): 8–14. Trees, Andrew S. (2004). The Founding Fathers and the Politics of Character. Princeton: Princeton University Press. Weston, Rob N. (1994). "Alexander Hamilton and the Abolition of Slavery in New York". Afro-Americans in New York Life and History 18 (1): 31–45. An undergraduate paper, which concludes that Hamilton was ambivalent about slavery. White, Richard D. (2000). "Exploring the Origins of the American Administrative State: Recent Writings on the Ambiguous Legacy of Alexander Hamilton". Public Administration Review 60 (2): 186–190. Wood, Gordon S. (2009). Empire of Liberty: A History of the Early Republic, 1789–1815. New York: Oxford University Press. The most recent synthesis of the era. Wright, Robert E. (2002). Hamilton Unbound: Finance and the Creation of the American Republic. Westport: Greenwood Press. ——— (2008). One Nation Under Debt: Hamilton, Jefferson, and the History of What We Owe. New York: McGraw-Hill. Ambrose, Douglas, and Robert W. T. Martin, eds. The Many Faces of Alexander Hamilton: The Life & Legacy of America's Most Elusive Founding Father. 2006. Brookhiser, Richard. Alexander Hamilton, American. Free Press, 1999, ISBN 978-0-684-83919-6. Cooke, Jacob Earnest. Alexander Hamilton. Charles Scribner's Sons, 1982. ISBN 0-684-17344-1. Ellis, Joseph J. Founding Brothers: The Revolutionary Generation. 2002. (Won Pulitzer Prize). Ellis, Joseph J. His Excellency: George Washington. 2004. Fleming, Thomas. Duel: Alexander Hamilton, Aaron Burr, and the Future of America. 2000, ISBN 978-0-465-01737-9. Flexner, James Thomas. The Young Hamilton: A Biography. Fordham University Press, 1997, ISBN 978-0-8232-1790-8. Hendrickson, Robert. "Hamilton I (1757-1789)". Mason/Charter, 1976. ^ Hamilton's spelling "Lavien" may be a Sephardic version of "Levine". The couple may have lived apart from one another under an order of legal separation, with Rachel as the guilty party, meaning that her remarriage was not permitted on St. Croix. ^ Using Supreme Court citations, the five most cited were Federalist No. 42 (Madison, 33 decisions), Federalist No. 78 (Hamilton, 30 decisions), Federalist No. 81 (Hamilton, 27 decisions), Federalist No. 51 (Madison, 26 decisions), Federalist No. 32 (Hamilton, 25 decisions). ^ quote:I see by a paper of last evening that even in New York a meeting of the people has taken place, at the instance of the Republican party, and that a committee is appointed for the like purpose. See also Smith, (2004) p.832. ^ Flexner, Introduction; Lodge, Henry Cabot, Alexander Hamilton, written while a junior professor; Vandenburg, Arthur H., The Greatest American, 1922, while still a newspaper editor; for the effect on his career of his "advocacy of his party's views", see ANB, "Arthur H. Vandenburg". ^ For a wider discussion of the rhetoric of "slavery to the British", see David Hackett Fischer: Liberty and Freedom, chapters I and II. ^ Congress offered to compensate the masters after the war. ^ Laughner, Becky (2011). "Alexander Hamilton: Lineage and Legacy". Financial History (100): 24. ^ a b c d Practical Proceedings in the Supreme Court of the State of New York. Alexander Hamilton. Forward by Williard Sterne Randall. p. ix. 2004. New York Law Journal. ^ a b c Chernow, p. 17. ^ Chernow; Flexner; Mitchell's Concise Life. McDonald, p. 366, n. 8, favors 1757 but acknowledges its minority status, saying that the probate clerk's alternate spelling of "Lavien" suggests unreliability. ^ Gordon, John Steele. "The Self Made Founder," American Heritage, April/May 2004. ^ Randall, Willard Sterne (2003). Alexander Hamilton: A Life. New York: Harper Collins Publishers. p. 78. ^ Miller, John C. (1959). Alexander Hamilton: Portrait in Paradox. New York: Harper and Row, Publishers. p. 9. ^ Lefkowitz, Arthur S., George Washington's Indispensable Men: The 32 Aides-de-Camp Who Helped Win the Revolution, Stackpole Books, 2003, pp. 15 & 108. ^ Hendrickson, Robert (1976). Hamilton I (1757-1789). New York: Mason/Charter. p. 119. ^ Lodge, pp. 1:15–20; Miller, pp. 23–6. ^ Brant, p. 100; Chernow, p. 176. ^ a b Kohn; Ellis 2004, pp. 141–4. ^ Chernow, pp. 177–80, citing Washington to Hamilton, April 4, 1783. Retrieved on May 20, 2008. ^ Chernow, pp. 197–9; McDonald, pp. 64–9. ^ Coffman, Steve (2012). Words of the Founding Fathers. NC, USA: McFarland. p. 121. ^ Lomask, pp. 139–40, 216–7, 220. ^ "Book of Members, 1780–2010: Chapter H". American Academy of Arts and Sciences. Retrieved August 7, 2014. ^ a b Stelzer, Irwin (January 10, 2011). "Who Is the Euro Zone's Alexander Hamilton?". Wall Street Journal. Retrieved January 10, 2011. ^ Farrand, Max, ed., The Records of the Federal Convention of 1787, 4 vols. (New Haven, CT, 1937), 3:533–4. ^ Miller, John (2003). Alexander Hamilton and the Growth of the New Nation. New Brunswick, US, and London, UK: Transaction Publishers. p. 251. ^ "Madison to Jefferson". March 2, 1794. Retrieved October 14, 2006. ^ Bemis, Samuel Flagg, Jay's Treaty (quoted); Elkins and McKitrick, pp. 411 ff. ^ Elkins and McKitrick; Age of Federalism, pp. 523–8, 859. Rutledge had his own plan, to have Pinckney win with Jefferson as Vice President. ^ Newman, pp. 44, 76–8. ^ ANB, "James McHenry"; he also fired Timothy Pickering. ^ Elkins and McKitrick, pp. 734–40. ^ Isenberg, Nancy, Fallen Founder: The Life of Aaron Burr, New York: Penguin Books, 2007, pp. 211-212. ^ West, John G.; MacLean, Iain S. (1999). Encyclopedia of religion in American politics. Greenwood Publishing Group. ^ a b Freeman, Joanne B (April 1996). "Dueling as Politics: Reinterpreting the Burr–Hamilton Duel". ^ Wheelan, Joseph, Jefferson's Vendetta: The Pursuit of Aaron Burr and the Judiciary, New York, Carroll & Graf Publishers, 2005, ISBN 978-0-7867-1437-7, p. 90. ^ Thomas Frederick Wilson (1992). The Power "to Coin" Money: The Exercise of Monetary Powers by the Congress. M.E. Sharpe. p. 94. ^ Lawrence S. Kaplan (1998). Thomas Jefferson: Westward the Course of Empire. Rowman & Littlefield. p. 284. ^ Sean Wilentz, "Book Reviews," Journal of American History Sept, 2010 v. 97# 2 p 476; quotes from Wilentz. ^ The New York Times, "In New York, Taking Years Off the Old, Famous Faces Adorning City Hall", December 6, 2006. ^ a b "Hamilton-Holly House Designation Report - NYC.gov" (PDF). Retrieved 8 January 2013. ^ "Hamilton Grange National Memorial (US National Park Service)". Nps.gov. Retrieved March 14, 2009. ^ "Hamilton Grange National Memorial (US National Park Service)". Nps.gov. Archived from the original on August 28, 2010. Retrieved September 17, 2010. 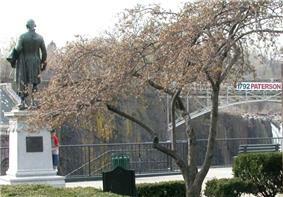 ^ "Central Park - Alexander Hamilton". New York City Department of Parks & Recreation. 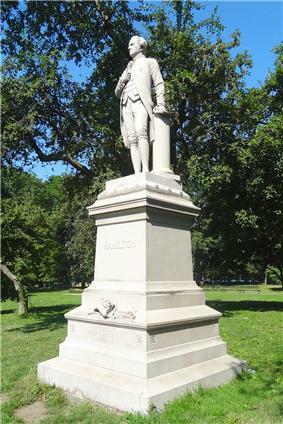 ^ "Alexander Hamilton Monument (in Lincoln Park)". ExploreChicago.org. Retrieved September 6, 2012. ^ Chan 2004, p. 207. ^ Chernow 2004, p. 629. ^ Stewart, David O. (2008). The Summer of 1787: The Men Who Invented the Constitution. ^ Braun, Jerome (2010). To Break Our Chains: Social Cohesiveness and Modern Democracy. ^ Marable, Manning (2011). Living Black History: How Reimagining the African-American Past Can Remake America's Racial Future. ^ Mitchell, pp. I:175–7, I:550 n. 92, citing the Journals of the Continental Congress, March 29, 1779; Wallace, p. 455. ^ Hamilton to Jay, March 14, 1779; Chernow, p. 121; McManus, pp. 154–7. ^ McDonald, p. 34; Flexner, pp. 257–8. ^ Hamilton, John Church (1834). The life of Alexander Hamilton, Volume 1. the New York Public Library: Halsted & Voorhies. p. 10. ^ Lawrence S. Kaplan (2002). Alexander Hamilton: Ambivalent Anglophile. Rowman & Littlefield. p. 8. 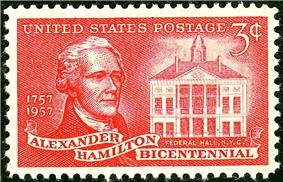 The first postage stamp to honor Hamilton was issued by the U.S. Post Office in 1870. 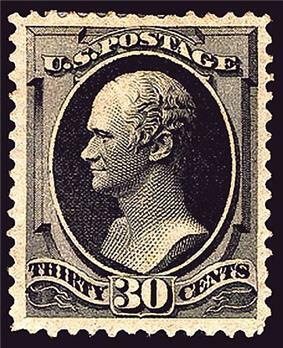 The portrayals on the 1870 and 1888 issues are from the same engraved die, which was modeled after a bust of Hamilton by Italian sculptor Giuseppe Ceracchi The Hamilton 1870 issue was the first US Postage stamp to honor a Secretary of the Treasury. The three-cent red commemorative issue, which was released on the 200th anniversary of Hamilton's birth in 1957, includes a rendition of the Federal Hall building, located in New York City. Gordon Wood says that Hamilton dropped his youthful religiosity during the Revolution and became, "a conventional liberal with theistic inclinations who was an irregular churchgoer at best"; however, he returned to religion in his last years. Chernow says that, "Like Adams, Franklin, and Jefferson, Hamilton had probably fallen under the sway of deism, which sought to substitute reason for revelation and dropped the notion of an active God that will intervene in human affairs. At the same time, he never doubted God's existence, embracing Christianity as a system of morality and cosmic justice." While Hamilton and the other founders could be considered deists in the sense that they embraced "rational religion", they were not deists in the sense of rejecting the idea of divine intervention. Hamilton, as a youth in the West Indies, was an orthodox and conventional Presbyterian of the "New Light" evangelical type (as opposed to the "Old Light" Calvinists); he was being taught by a student of John Witherspoon, a moderate of the New School. He wrote two or three hymns, which were published in the local newspaper. Robert Troup, his college roommate, noted that Hamilton was "in the habit of praying on his knees night and morning." From the 1860s onwards members of Japan's Meiji leadership, after touring America's post-Civil War political and industrial landscape, embraced Hamilton's words and work as being applicable to their own need to modernize. Within the Grant Administration they found Hamiltonian advocates who opened up American financial and manufacturing operations for Japanese inspection. The Meiji leadership sent their sons to study American finance and industry in New York, New Jersey, Philadelphia, and other centers of commerce. These Japanese leaders found Hamilton's words and work also being used by Bismarck's administration in Germany, having been brought to Germany by Friedrich List in the 1840s after List had spent time in exile in Philadelphia. Later Hamilton's reports to Congress could be found in libraries not only in Japan but in Taiwan and Korea, after they came under the colonial rule of Meiji Japan. Post-1945 leaders in both countries (i.e., South Korea) used Hamilton's Report on Credit to establish their own modern financial systems [Austin. 2009]. Hamilton opposed the British ideas of free trade, which he believed skewed benefits to colonial and imperial powers, in favor of US protectionism, which he believed would help develop the fledgling nation's emerging economy. Henry C. Carey was inspired by his writings. Some say he influenced the ideas and work of the German Friedrich List. Hamilton is sometimes considered the "patron saint" of the American School of economic philosophy that, according to one historian, dominated economic policy after 1861. He firmly supported government intervention in favor of business, after the manner of Jean-Baptiste Colbert, as early as the fall of 1781. He opposed the compromise at the 1787 Constitutional Convention by which the federal government could not abolish the slave trade for 20 years, and was disappointed when he lost that argument. Scant evidence has been interpreted by a few to indicate Hamilton may have owned household slaves, as did many wealthy New Yorkers (the evidence for this is indirect; McDonald interprets it as referring to paid employees). Hamilton never supported forced emigration for freed slaves. Horton has argued from this that he would be comfortable with a multiracial society, and that this distinguished him from his contemporaries. In international affairs, he supported Toussaint L'Ouverture's black government in Haiti after the revolt that overthrew French control, as he had supported aid to the slaveowners in 1791—both measures hurt France. In January 1785, he attended the second meeting of the New York Manumission Society (NYMS). Jay was president and Hamilton was the first secretary and later became president. Chernow notes how the membership soon included many of Hamilton's friends and associates. He was a member of the committee of the society that petitioned the legislature to end the slave trade, and that succeeded in passing legislation banning the export of slaves from New York. In the same period, Hamilton felt bound by the rule of law of the time and his law practice facilitated the return of a fugitive slave to Henry Laurens of South Carolina. Hamilton, often in close association with his friend John Jay, was a leader in the anti-slavery movement in New York City following the Revolutionary War. They founded the New York Manumission Society to abolish the city's role in the international slave trade, and to pass legislation that would permanently end slavery in New York State. Both goals were accomplished by 1799. Hamilton argued that blacks' natural faculties were as good as those of free whites, and he warned that the British would arm the slaves if the patriots did not. In his 21st-century biography, Chernow cites this incident as evidence that Hamilton and Laurens saw the Revolution and the struggle against slavery as inseparable. Hamilton attacked his political opponents as demanding freedom for themselves and refusing to allow it to blacks. Until recently the prevailing scholarly view was that Hamilton, like the Founders generally, lacked a deep concern about slavery. Chernow (2004) calls him "a fervent abolitionist", Stewart (2008) states he was a "lifelong opponent of slavery", and Braun (2010) says he "was a leading anti-slavery advocate". Historian Manning Marable (2011) says Hamilton "vigorously opposed the slave trade and slavery's expansion." Hamilton and Elizabeth had eight children, including two named Phillip. The elder Philip, Hamilton's first child (born January 22, 1782), was killed in 1801 in a duel with Alexander, born May 16, 1796; James Alexander (April 14, 1788 – September 1878); John Church, born August 22, 1792; William Stephen, born August 4, 1797; and Eliza, born November 26, 1799. Hamilton's widow, Elizabeth (known as Eliza or Betsy), survived him for fifty years, until she died in Washington, D.C. in 1854; Hamilton referred to her as the "best of wives and best of women". An extremely religious woman, Eliza spent much of her life working to help widows and orphans. She co-founded New York's first private orphanage, the New York Orphan Asylum Society. Despite the Reynolds affair, Alexander and Eliza were very close, and especially grew closer afterwards. A statue, by James Earle Fraser, was dedicated on May 17, 1923, on the south terrace of the Treasury Building, in Washington. 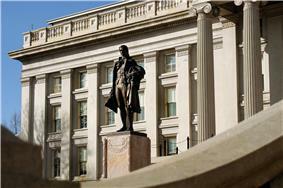 Statue of Alexander Hamilton in front of the Treasury Building. A statue honoring Alexander Hamilton in Chicago was mired in controversy, at least concerning the surrounding architecture. Kate Sturges Buckingham (1858 – 1937), of the Buckingham Fountain family, commissioned the monument. Its impetus was that Treasury Secretary Hamilton "secured the nation's financial future and made it possible for her own family to make its fortune in grain elevators and banking. Consequently, John Angel was hired to model a figurative sculpture and the Finnish architect Eliel Saarinen was to create a "colossal architectural setting" for it. The proposed 80-foot tall columned shelter was poorly received. By Ms. Buckingham's death in 1937, the sculpture's setting. location and design were uncertain. Conspiracy allegations surfaced, and the matter became mired in litigation. After the courts ordered the construction to be completed by 1953, the trustees hired architect Samuel A. Marx. The structure was completed, had structural problems, and was eventually demolished in 1993. The statue was gilded, and is still on display. In 1880, his grandson, John C. Hamilton, commissioned Carl Conrads to sculpt a granite statue, located in Central Park, New York City. The U.S. Army's Fort Hamilton in Brooklyn is named after Hamilton. 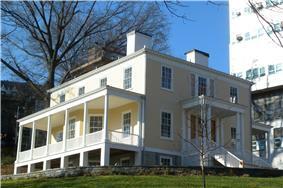 His country home, named "The Grange", is in Hamilton Heights, a neighborhood in upper Manhattan. It has been restored to its condition in 1802. The main administration building of the Coast Guard Academy in New London, Connecticut, is named Hamilton Hall to commemorate Hamilton's creation of the United States Revenue Cutter Service, one of the predecessor services of the United States Coast Guard. Alexander Hamilton served as one of the first trustees of the Hamilton-Oneida Academy in New York state. When the Academy received a college charter in 1812, the school was formally renamed Hamilton College. There is a prominent statue of Alexander Hamilton in front of the school's chapel (commonly referred to as the "Al-Ham" statue) and the Burke Library has an extensive collection of Hamilton's personal documents. The only home Hamilton ever owned was a Federal style mansion designed by John McComb Jr., which he built on his 32 acre country estate in Hamilton Heights in upper Manhattan. He named the house –which was completed in 1802– the "Grange" after his grandfather Alexander's estate in Ayrshire, Scotland. The house remained in the family until 1833 when his widow sold it to Thomas E. Davis, a British born real estate developer for $25,000. Part of the proceeds were used by Eliza to purchase a new townhouse from Davis (Hamilton-Holly House) in Greenwich Village with her son Alexander Hamilton Jr. The Grange, first moved from its original location in 1889, was moved again in 2008 to a spot in St. Nicholas Park on land that was once part of the Hamilton estate. The historic structure was restored to its original 1802 appearance in 2011, and is maintained by the National Park service as Hamilton Grange National Memorial. 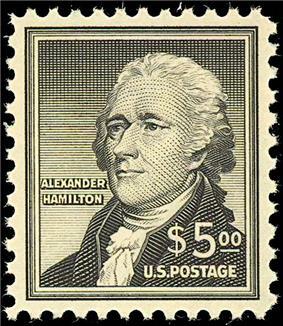 On March 19, 1956, the United States Postal Service issued the $5 Liberty Issue postage stamp honoring Hamilton. By the time of the American Civil War, Hamilton's portrait began to appear on US currency, including the $2, $5, $10, and $50 notes. His likeness also began to appear on US postage in 1870. His portrait has continued to appear on US postage and currency, and most notably appears on the modern $10 bill. Hamilton also appears on the $500 Series EE Savings Bond. The source of the face on the $10 bill is John Trumbull's 1805 portrait of Hamilton, in the portrait collection of New York City Hall. The Hamilton Grange National Memorial, now located in St. Nicholas Park. The Grange is the only home Hamilton ever owned and is where he was living at the time of his death. These have evolved into the two, now traditional, views of Hamilton: One, which has been dominant among scholars in recent years, represents him as a "forerunner of the modern liberal capitalist economy," opposed to the agrarianism, or the slave-holding self-interest, of Jefferson and Madison. The other has seen him as a centralizer, to the point sometimes of advocating monarchy. 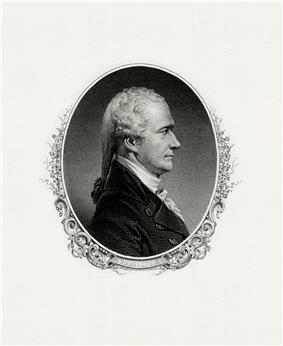 Gordon Wood presented a third view in Empire of Liberty: A History of the Early Republic, 1789–1815; Hamilton would have set up an essentially European society, with a republican monarchy, and strong institutions such as the Bank of the United States; Wood holds that Jefferson better understood the society around him, individualist, egalitarian, and money-making. Though the Constitution was ambiguous as to the exact balance of power between national and state governments, Hamilton consistently took the side of greater federal power at the expense of the states. As Secretary of the Treasury, he established—against the intense opposition of Secretary of State Jefferson—the country's first national bank. Hamilton justified the creation of this bank, and other increased federal powers, under Congress's constitutional powers to issue currency, to regulate interstate commerce, and to do anything else that would be "necessary and proper" to enact the provisions of the Constitution. Jefferson, on the other hand, took a stricter view of the Constitution: parsing the text carefully, he found no specific authorization for a national bank. This controversy was eventually settled by the Supreme Court of the United States in McCulloch v. Maryland, which in essence adopted Hamilton's view, granting the federal government broad freedom to select the best means to execute its constitutionally enumerated powers, specifically the doctrine of implied powers. The duel began at dawn. Vice President Burr shot Hamilton, delivering what proved to be a fatal wound. Hamilton's shot broke a tree branch directly above Burr's head. A letter that Hamilton wrote the night before the duel states, "I have resolved, if our interview [duel] is conducted in the usual manner, and it pleases God to give me the opportunity, to reserve and throw away my first fire, and I have thoughts even of reserving my second fire", thus asserting an intention to miss Burr. The circumstances of the duel, and Hamilton's actual intentions, are still disputed. Neither of the seconds, Pendleton or Van Ness, could determine who fired first. Soon after, they measured and triangulated the shooting, but could not determine from which angle Hamilton fired. Burr's shot, however, hit Hamilton in the lower abdomen above the right hip. The bullet ricocheted off Hamilton's second or third liver and diaphragm before becoming lodged in his first or second lumbar vertebra. Biographer Ron Chernow considers the circumstances to indicate that Burr fired second, after having taken deliberate aim. Soon after the 1804 gubernatorial election in New York—in which Aaron Burr—the Albany Register published Charles D. Cooper's letters, citing Hamilton's opposition to Burr and alleging that Hamilton had expressed "a still more despicable opinion" of the Vice President at an upstate New York dinner party. Burr, sensing an attack on his honor, and surely still stung by his political defeat, demanded an apology. Hamilton refused because he could not recall the instance; also, any apology was certain to be published, and would lay him open to accusations of cowardice. In 1801, Hamilton announced his intention to withdraw from the Federalist Party if Burr became its presidential candidate in 1804. In 1802, he began to organize "The Christian Constitutional Society", the first principle of which, even before supporting the Constitution, was "the support of the Christian religion". On the Federalist side, Governor Arthur Fenner of Rhode Island denounced these "jockeying tricks" to make Pinckney President, and one Rhode Island elector voted for Adams and Jay. Jefferson and Burr tied for first and second; Pinckney came in fourth. In September, Hamilton wrote a pamphlet called Letter from Alexander Hamilton, Concerning the Public Conduct and Character of John Adams, Esq. President of the United States that was highly critical of Adams, though it closed with a tepid endorsement. He mailed this to two hundred leading Federalists; when a copy fell into the Democratic-Republicans' hands, they printed it. This hurt Adams's 1800 reelection campaign and split the Federalist Party, virtually assuring the victory of the Democratic-Republican Party, led by Jefferson, in the election of 1800; it destroyed Hamilton's position among the Federalists. In November 1799, the Alien and Sedition Acts had left one Democratic-Republican newspaper functioning in New York City; when the last, the New Daily Advertiser, reprinted an article saying that Hamilton had attempted to purchase the Philadelphia Aurora and close it down, Hamilton had the publisher prosecuted for seditious libel, and the prosecution compelled the owner to close the paper. In the 1800 election, Hamilton worked to defeat not only the rival Democratic-Republican candidates, but also his party's own nominee, John Adams. Hamilton aided in all areas of the army's development, and officially served as the Senior Officer of the United States Army as a Major General from December 14, 1799, to June 15, 1800. The army was to guard against invasion from France. Adams, however, derailed all plans for war by opening negotiations with France. Adams had held it proper to retain the members of Washington's cabinet, except for cause; he found, in 1800 (after Washington's death), that they were obeying Hamilton rather than himself, and fired several of them. The eventual program included a Stamp Act like that of the British before the Revolution and other taxes on land, houses, and slaves, calculated at different rates in different states, and requiring difficult and intricate assessment of houses. This provoked resistance in southeastern Pennsylvania, led primarily by men such as John Fries who had marched with Washington against the Whiskey Rebellion. To fund this army, Hamilton wrote regularly to Oliver Wolcott, Jr., his successor at the Treasury; William Loughton Smith, of the House Ways and Means Committee; and Senator Theodore Sedgwick of Massachusetts. He directed them to pass a direct tax to fund the war. Smith resigned in July 1797, as Hamilton scolded him for slowness, and told Wolcott to tax houses instead of land. During the Quasi-War of 1798–1800, and with Washington's strong endorsement, Adams reluctantly appointed Hamilton a major general of the army (essentially placing him in command, since Washington could no longer leave Mt. Vernon). If full-scale war broke out with France, Hamilton argued that the army should conquer the North American colonies of France's ally, Spain, bordering the United States. Adams resented Hamilton's influence with Washington and considered him overambitious and scandalous in his private life; Hamilton compared Adams unfavorably with Washington and thought him too emotionally unstable to be President. Hamilton took the election as an opportunity: he urged all the northern electors to vote for Adams and Pinckney, lest Jefferson get in; but he cooperated with Edward Rutledge to have South Carolina's electors vote for Jefferson and Pinckney. If all this worked, Pinckney would have more votes than Adams, Pinckney would become President, and Adams would remain Vice President; but it did not work. The Federalists found out about it (even the French minister to the United States knew), and northern Federalists voted for Adams but not for Pinckney, in sufficient numbers that Pinckney came in third and Jefferson became Vice President. Adams resented the intrigue, since he felt his service to the nation was much more extensive than Pinckney's. In the election of 1796, under the Constitution as it stood then, each of the presidential electors had two votes, which they were to cast for different men. The one who received most votes would become President, the second-most, Vice President. This system was not designed with the operation of parties in mind, as they had been thought disreputable and factious. The Federalists planned to deal with this by having all their Electors vote for John Adams, the Vice President, and all but a few for Thomas Pinckney of South Carolina (who was on his way home from being Minister to Spain, where he had negotiated a popular treaty); Jefferson chose Aaron Burr as his vice presidential running mate. Hamilton's resignation as Secretary of the Treasury in 1795 did not remove him from public life. With the resumption of his law practice, he remained close to Washington as an advisor and friend. Hamilton influenced Washington in the composition of his Farewell Address; Washington and members of his Cabinet often consulted with him. In 1791, Hamilton became involved in an affair with Maria Reynolds that would eventually badly damage his reputation. Reynolds's complicit husband, James, blackmailed Hamilton for money by threatening to inform Hamilton's wife. When James Reynolds was arrested for counterfeiting, he contacted several prominent members of the Democratic-Republican Party, most notably James Monroe and Aaron Burr, touting that he could expose a top-level official for corruption. Presuming that James Reynolds could implicate Hamilton in an abuse of his position in Washington's Cabinet, they interviewed Hamilton with their suspicions. Hamilton insisted he was innocent of any misconduct in public office, but admitted to an affair with Maria Reynolds. Since this was not germane to Hamilton's conduct in office, Hamilton's interviewers did not publish about Reynolds. When rumors began spreading after his retirement some years later, Hamilton published a confession of his affair, shocking his family and supporters by not merely confessing but also by inexplicably narrating the affair at an unexpected level of detail. This public revelation damaged Hamilton's reputation for the rest of his life. However, in 1794 policy toward Britain became a major point of contention between the two parties. 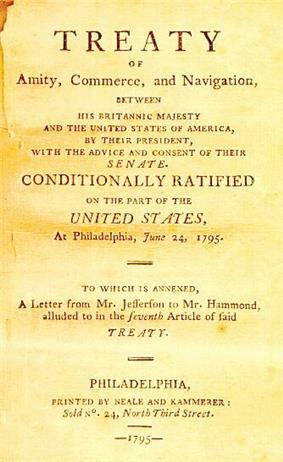 Hamilton and the Federalists wished for more trade with Britain, the new nation's largest trading partner. The Republicans saw Britain as the main threat to republicanism and proposed instead a trade war. When France and Britain went to war in early 1793, all four members of the Cabinet were consulted on what to do. They and Washington unanimously agreed to remain neutral, and to send Genêt home. The Jeffersonian Republicans opposed banks and cities, and favored France. They built their own national coalition to oppose the Federalists. Both sides gained the support of local political factions; each side developed its own partisan newspapers. Noah Webster, John Fenno, and William Cobbett were energetic editors for the Federalists; Benjamin Franklin Bache and Philip Freneau were fiery Republican editors. All the newspapers were characterized by intense personal attacks, major exaggerations and invented claims. In 1801, Hamilton established a daily newspaper, the New York Evening Post and brought in William Coleman as editor. It is still publishing (as the New York Post). Hamilton assembled a nationwide coalition to garner support for the Administration, including the expansive financial programs Hamilton had made Administration policy and especially the president's policy of neutrality in the European war between Britain and France. Hamilton's public relations campaign attacked the French minister Edmond-Charles Genêt (he called himself "Citizen Genêt") who tried to appeal to voters directly, which Federalists denounced as foreign interference in American affairs. Subsequently in 1791, with his ideas for manufacturing being a major influence, Hamilton, along with Coxe and several entrepreneurs from New York and Philadelphia helped form the Society for the Establishment of Useful Manufactures, a private industrial corporation. The location at Great Falls of the Passaic River in New Jersey was selected due to access to raw materials, it being densely inhabited, and having access to water power from the falls of the Passaic. The factory town was named Paterson after New Jersey's Governor William Paterson, who signed the charter. The profits were to derive from specific corporates rather than the benefits to be conferred to the nation and the citizens, which was unlike the report. Hamilton also suggested the first stock to be offered at $500,000 and to eventually increase to $1 million, and welcomed state and national government subscriptions alike. The company never materialized any success as numerous shareholders reneged on stock payments, some of the Society's members were soon bankrupt, while William Duer, the governor of the program, wounded up in debtors' prison. In spite of Hamilton efforts to mend the disaster, the company would expire by 1796. Congress shelved the report without much debate (except for Madison's objection to Hamilton's formulation of the General Welfare clause, which Hamilton construed liberally as a legal basis for his extensive programs). The Report has been often quoted by protectionists since. Among the ways that the government could assist in manufacturing, Hamilton mentioned levying protective duties on imported foreign goods that were also manufactured in the United States, to withdraw duties levied on raw materials needed for domestic manufacturing, pecuniary boundaries, and encouraging immigration for people to better themselves in similar employment opportunities. Hamilton's next report was his Report on Manufactures. Although he was requested by Congress on 15 January of 1790 for a report for manufacturing that would expand the United States independence, the report was not submitted until 5 December of 1791. In the report, Hamilton quoted from Wealth of Nations and used the French physiocrats as an example for rejecting agrarianism and the physiocratic theory; respectively. Hamilton also refuted Smith's ideas of government noninterference, as it would have been detrimental for trade with other countries. Hamilton also thought of the United States being a primarily agrarian country would be a disadvantage in dealing with Europe. In response to the agrarian detractors, Hamilton stated that the agriculturists' interest would be advanced by manufactures, and that agriculture was just as productive as manufacturing. One of the principal sources of revenue Hamilton prevailed upon Congress to approve was an excise tax on whiskey. Strong opposition to the whiskey tax by cottage producers in remote, rural regions erupted into the Whiskey Rebellion in 1794; in Western Pennsylvania and western Virginia, whiskey was the basic export product and was fundamental to the local economy. In response to the rebellion, believing compliance with the laws was vital to the establishment of federal authority, Hamilton accompanied to the rebellion's site President Washington, General Henry "Light Horse Harry" Lee, and more federal troops than were ever assembled in one place during the Revolution. This overwhelming display of force intimidated the leaders of the insurrection, ending the rebellion virtually without bloodshed. Congress established the Revenue Cutter Service on August 4, 1790, which is viewed as the birth of the United States Coast Guard. By 1792, Hamilton's principles were adopted by Congress, resulting in the Coinage Act of 1792, and the creation of the United States Mint. There was to be a ten dollar Gold Eagle coin, a silver dollar, and fractional money ranging from one-half to fifty cents. The coining of silver and gold was issued by 1795. In 1791, Hamilton submitted Report on the Establishment of a Mint to the House of Representatives. Most of Hamilton's ideas for this report were from European economists, resolutions from Continental Congress meetings from 1785 and 1786, and from people such as Gouverneur Morris and Thomas Jefferson. Due to the Spanish coin being the most circulated coin in the United States at the time, Alexander Hamilton proposed that the minting of the United States dollar weighing almost as much as the Spanish peso would be the simplest way to introduce a national currency. Hamilton wanted the U.S. dollar system to be set for decimals rather than the eights like the Spanish mint. In spite of preferring a monometallic gold standard, he issued a bimetallic currency at ratio that was to be similar to most European countries. What was different from the European currencies was his desire to overprice the gold on the grounds that the United States would always receive an influx of silver from the West Indies. Hamilton desired the minting of small value coins such as silver ten-cent, copper, and half-cent pieces, for reducing the cost of living for the poor. His motives weren't motivated for charity, as he also had objectives of the general public to become accustomed to handling money on a frequent basis. Turban Head eagle, one of the first gold mints following the Coinage Act of 1792. Washington hesitated to sign the bill, as he received suggestions from Attorney-General Edmund Randolph and Thomas Jefferson. Jefferson dismissed the 'necessary and proper' clause as reasoning for the creation of a national bank, stating that the enumerated powers "can all be carried into execution without a bank." Along with Randolph and Jefferson's objections, Washington's involvement in the movement of the capital from Philadelphia is also thought to be a reason for his hesitation. In response to the objection of the 'necessary and proper' clause, Hamilton stated that "Necessary often means no more than needful, requisite, incidental, useful, or conductive to", and the bank was a "convenient species of medium in which they (taxes) are to be paid.". Washington would eventually sign the bill into law. The bill eventually passed in an overwhelming fashion 39 to 20, on the 8th of February, 1791. Madison argued his case of where the power of a bank could be established within the Constitution, but he failed to sway members of the House, and his authority on the constitution was question by a few members. Madison warned the Pennsylvania congress members that he would attack the bill as unconstitutional in the House, and followed up on his threat. Madison and Jefferson also opposed the bank bill; however, the potential of the capital not being moved to the Potomac if the bank was to have a firm establishment in Philadelphia (the current capital of the United States) was a more significant reason, and actions that Pennsylvania members of Congress took to keep the capital there made both men anxious.